We’d love your help. Let us know what’s wrong with this preview of 2013 Redlitzer Anthology by Angela Slatter. A collection of the shortlisted stories from the 2013 Redlitzer Writing Competition. 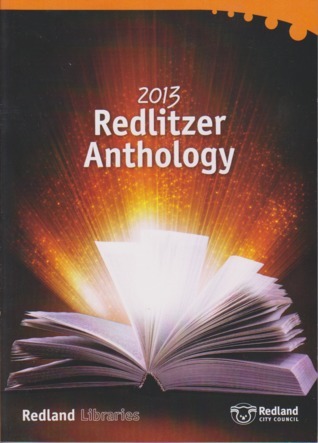 To ask other readers questions about 2013 Redlitzer Anthology, please sign up. The 2013 Redlitzer Anthology contains nineteen stories from the shortlisted winners of the 2013 Redlitzer Writing Competition. Nine stories are from the adult category and the other ten are from the teenage category (there was also a junior category, but they were published in a separate anthology). I went into reading the anthology knowing there would be a broad range of genres and styles since the only thing binding the anthology together (apart from glue) was the fact all the authors are from The 2013 Redlitzer Anthology contains nineteen stories from the shortlisted winners of the 2013 Redlitzer Writing Competition. Nine stories are from the adult category and the other ten are from the teenage category (there was also a junior category, but they were published in a separate anthology). I went into reading the anthology knowing there would be a broad range of genres and styles since the only thing binding the anthology together (apart from glue) was the fact all the authors are from the same geographical area. Despite the fact I knew there would be genres that aren't my usual cup of tea there wasn't a single story in the volume which was disappointing. And I mean it. I'm not saying this because I'm published in there, I genuinely found every story interesting and well written. I honestly expected there to be at least one story that fell short (in my opinion, not overall), but no, I really did like every single story. The stories range from tales of love (and lust in the case of 'Mates' by Linda Stevenson), memoir pieces (like Hazel Barker's 'Hunger'), action and adventure (and robbing the local pub in 'Go On Three' by Robbie Milton) and of course my favourite genre of speculative fiction has a pretty decent showing. Angela’s short Angela Slatter is the author of the urban fantasy novels Vigil (2016) and Corpselight (2017), as well as eight short story collections, including The Girl with No Hands and Other Tales, Sourdough and Other Stories, The Bitterwood Bible and Other Recountings, and A Feast of Sorrows: Stories. She has won a World Fantasy Award, a British Fantasy Award, a Ditmar, and six Aurealis Awards.